Buying a used car instead of a new one has long been a surefire way to save money. Someone else takes the initial depreciation hit – between 25 to 30 percent on average for the first year – so you pay a lot less for the car and finance a smaller amount. But some vehicles depreciate faster than others. And if you can key in on these relatively new used models, you can potentially save up to 60 percent off what you’d have to pay for this year’s new model. You could practically buy another vehicle with the savings. They are typically leased rather than purchased, which drives up the rate of depreciation. Their primary customers always want the latest, usually expensive, features. While cool, these features don’t do a very good job of supporting the car’s value. For used-car buyers, this is all good news. The worst depreciation already has happened, and the car’s value will remain fairly consistent in the years to come. There are a few caveats to keep in mind when buying a used luxury car. Your insurance might be more expensive, so make sure you get a quote beforehand. Also, maintenance and parts will likely be costlier than with a non-luxury-branded vehicle. Still, if you’re aware of what you’re getting into, you can get a posh car while saving tens of thousands off the price you’d pay if you bought the new version. The Lincoln Navigator got a substantial refresh for the 2015 model year, including a more efficient turbocharged V6 engine, revised styling, and the latest version of the MyLincoln Touch infotainment system. This is one of the few luxury SUVs that can tow a trailer, carry up to eight passengers, and still ride comfortably on the road. The Audi A6 is an elegant, well-rounded midsize luxury sedan with a strong array of available engines and nimble handling on the road. Our editors were impressed by the A6’s upscale interior, quiet cabin and its standard safety features. Most A6s come with all-wheel drive, too. If you like the idea of a full-size luxury sedan in the classic American mold, the 2015 Cadillac XTS is the car for you. The XTS is notable for its ultra-comfortable ride, numerous standard features and spacious rear seats. It also has one of the largest trunks available, which is perfect for extended road trips. 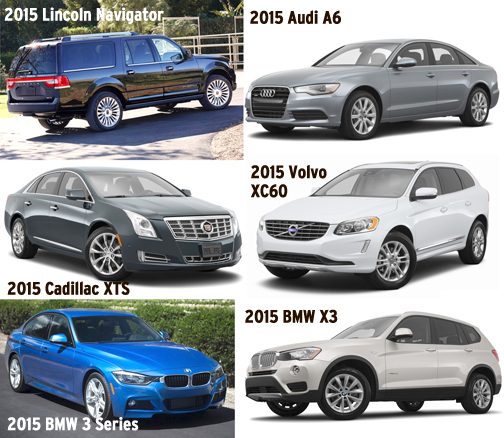 The Volvo XC60 was one of Edmunds’ top recommended compact luxury SUVs for 2015. It has attractive styling, a distinctive cabin design, supportive seats and handling that is more fun than you’d expect from a Volvo. Our editors recommend avoiding the sluggish 3.2-liter engine. The other available engines are more than up to the task. The 2015 BMW 3 Series is a small luxury sedan or wagon. You can find the 3 Series with rear-wheel or all-wheel drive and with gasoline, diesel or hybrid-electric engines. Whichever variation you choose, you will be pleased by its sharp handling and composed ride quality. Another option from BMW is the 2015 X3. It’s one of the standouts in the small luxury SUV class and is an excellent pick for shoppers seeking both sporty driving dynamics and family-friendly utility. As a new vehicle, the X3 is on the pricey side, but it becomes a more compelling package when it’s used and nearly half off. Used luxury cars can get you more bang for your buck if you are aware of the pros and cons. If you’re concerned about the long-term reliability, opt for a certified pre-owned vehicle, which offers more warranty coverage than a typical used car. And if you need more peace of mind, it’s worth considering buying an extended warranty. Just make sure to get warranty quotes from a few dealers to get the best price. Ronald Montoya is a senior consumer advice editor at Edmunds. Twitter: @rmontoyaedmunds.